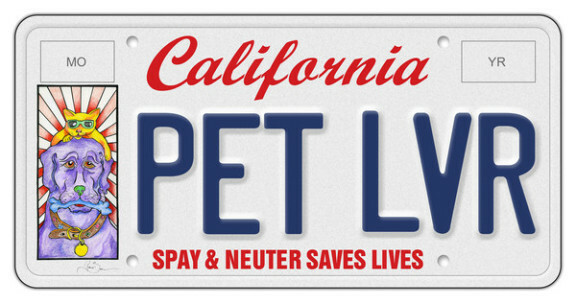 At half the price of a personalized license plate, Californians can order a Pet Lover's license plate and help to fund the state's spay and neuter program. Sponsored by the California Veterinary Medical Board and several national organizations, the plate is expected to provide a long term solution to pet overpopulation in the state. The artwork for California's Pet Lover's license plate was designed by actor/artist Pierce Brosnan, and it's kind of cool - a sporty cat, wearing sun glasses, like a true Californian, sitting on the head of a dog. Governor Brown's dog, Sutter, is the official dog promoter of the license plate, but it is hard to believe that the Governor is actively involved in the humanitarian treatment of pets judging from his stance on the euthanasia bill. Additionally, another questionable sponsor of the California Pet Lover's License Plate is PETA, whose shelters kill more dogs and cats than any other shelter in the U.S. (see PETA Kills While Others Rehabilitate 'Unadoptable' Pets). The Pet Lover plates can be ordered now for $50; renewal fees will be $40 per year subsequently. Catnip Overdose! Animal Video of the Day!! !